It’s that time of the year again, and you probably want your home spick-and-span for the onslaught of friends, relatives, and presents. So, before waving the white flag and calling in reinforcements from house cleaning services Carmel Indiana, we are giving you some tips on how to prepare your home for the holidays. You know those beautiful snow spray decorations your kids love so much? Well, in order for them to properly pop, cleaning your windows beforehand is a given. Simply applying the snow spray to windows not thoroughly cleaned won’t do. Not only will it look underwhelming, but the spray will not stick to the windows perfectly. So, give your windows a finishing touch with some rubbing alcohol, and prepare them for artistic decoration. It’s Christmas, not Halloween, and having your wall corners covered in cobwebs is not a welcome sight. You don’t want your tinsel and garland to have to fight their way through the cobwebs for attention. So, clean them up before putting up your Christmas ornaments. The same goes for dust. Christmas decorations seem to be dust magnets. So, if you don’t want your beautiful glass ornaments covered in excessive dust, take your feather duster and do away with it. These simple tasks in no way require professional assistance from house cleaning services Carmel Indiana. If you are planning on having family or friends over for Christmas, the first thing you should do is make some closet space. Chances are they are bringing a suitcase or two, and they probably don’t want to put it under the Christmas tree. Instead of having your hallway blocked by bags and suitcases, declutter the closets before they arrive. Also, vacuum the guestrooms, dust the surfaces, and put some fresh linen on the beds. Make their stay as comfortable and cozy as possible. There is going to be cooking involved, no doubt about it. And the best kind of cooking – hearty, comfort, holiday food cooking. Yum. But, in order for you to make it yummy, your kitchen needs to be ready. It is always better to prepare the kitchen in advance, because honestly, do you really want to be wasting your energy just before making a holiday meal? Clear out the cupboards and the fridge of all the old products. Polish the cutlery to wow your guests. Clean the oven for that tasty pot roast we know you’re making. Lastly, organize the appliances for quick and efficient use. Cook away! Cleaning the bathroom is certainly the last thing you would want to do during Christmas. Do it before then. We know, nobody likes it, but it has to be done. It doesn’t have to be all that difficult though. Let the heavy-duty cleaner disinfect the bowl. Wait to clean the tiles after you’ve had a hot shower, as the steam will loosen the dirt. Finally, you can use some rubbing alcohol or glass cleaner to remove any fingertips, toothpaste, or water stains from surfaces. Now your bathroom shines just like the rest of your decorated home. If you can’t be bothered though, there is an alternative. If all you want to do is put your feet up and have a glass of cider or eggnog, we understand, and are happy to help. 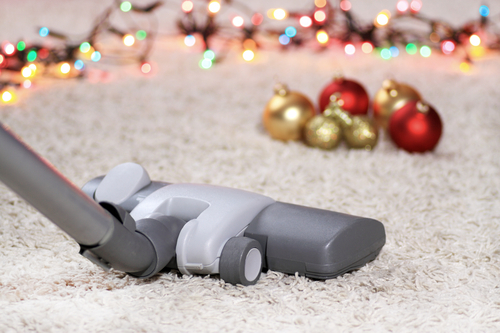 DeluxeMaid provides the best cleaning solutions for the holiday season, so give us a call.